The innovations at the Deseret media properties are perhaps the most comprehensive of those studied here. The changes, begun with the arrival of CEO Clark Gilbert in 2009, included the birth of a new digital entity, re-branding the editorial product to broaden the company’s audience base and the development of a platform to bring citizens into the content creation process. The changes, taken together, were designed to holistically restructure the economic base of the company amidst large declines in print revenues. The Deseret Management Corporation operates the 162-year-old Deseret News, Utah’s oldest continually published newspaper and local radio and television station KSL. The company itself is owned by The Church of Jesus Christ of Latter-day Saints and states as a part of its mission to “align our actions to honor the principles espoused by our owner,” already suggesting an atypical news brand. When Gilbert arrived at Deseret, his original mandate was to create a digital business plan. He ended up redeveloping the entire company, including the newspaper, for a new kind of existence in the digital era. In January 2010, the company formed Deseret Digital Media, the business unit that includes the web sites for the legacy media operations-the Deseret News and TV and radio station KSL. Months later, it launched Deseret Connect, a content management system that became a vehicle for generating community-based content for both print and digital platforms and has thus far enlisted about 3,000 contributors. 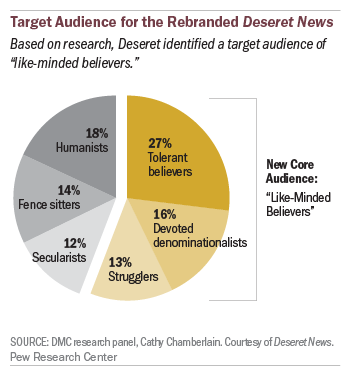 Before the year was out, The Deseret News underwent a fundamental transformation. Painful layoffs slashed the staff by nearly half. The paper relocated to the same building as its corporate siblings. It rebranded itself with a focus on six key editorial areas connected to values and family-reinforcing the influence of its ownership and using it to build a stronger targeted product. In 2012, the company extended that brand, launching a weekly national print edition on Sunday. Now it is embarking on an effort to syndicate its content. Thus far, the results seem encouraging. 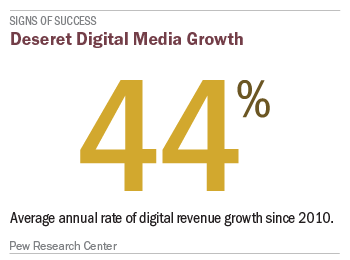 Gilbert estimates that Deseret Digital Media revenue has grown by an average of 44% each year and now accounts for 25% of company-wide revenue. 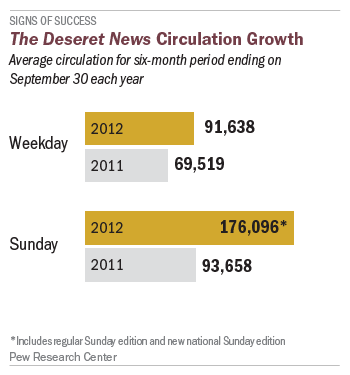 On the Deseret News side there have been significant circulation increases in the daily paper (about 33%) and on Sunday (about 90%), the latter bolstered by the new Sunday national edition. The revenues that come from the Deseret media properties are divided into three large piles. The biggest chunk, roughly 40% according to Gilbert, comes from the broadcasting operations at KSL. The fastest growing part of the company is Deseret Digital Media, which now accounts for about one-quarter of company revenues. The third leg of the tripod is the Deseret News print product, which produces about 35% of the overall revenue. In some ways, Salt Lake City is a classic city for a major metropolitan newspaper. (Two dailies, the Deseret News and Salt Lake Tribune, publish there under a joint operating agreement.) With a population of about 186,000, it is the largest city in Utah, the state capital and part of a metropolitan area with more 1 million residents. It is also the headquarters of the LDS, or Mormon Church. In the most recent publisher’s statement submitted to the Alliance for Audited Media, the News had a daily circulation of about 92,000. But in reorienting the paper’s editorial mission, Deseret has its eye on a readership that supersedes geographical boundaries. It is an audience, Gilbert believes, that is receptive to journalism that addresses values and family life. “This is over half the country and no one is there,” he says. “We are going to fill a gap that is just empty.” While the rollout of the weekly national edition is the clearest evidence of the desire to fill that gap, the effort to syndicate more Deseret content is another significant step in that direction. At Deseret, the first major step in reconfiguring the company was the creation of Deseret Digital Media. Although websites for both the print paper and the radio and television stations existed before Deseret Digital Media was started, they operated as separate businesses, often competitively, within the Deseret News and KSL brands. The creation of one digital business meant combining employees who had worked at the company’s different digital properties, an initial group of about 30 that has since swelled to over 100. In addition, Gilbert hired about half of the DDM leadership team from outside the company, from companies like overstock.com, Yahoo and Ancestry.com. Since Deseret Digital was established, Gilbert says, the web sites have undergone continual upgrades and both have had major redesigns. He estimates that unique visitors to the Deseret News site have grown by about 25% each year while page views have been increasing by about 20%. On the revenue side at Deseret Digital Media, several key factors are driving the levels of annual growth. One was the development of new online products for “long tail” customers-smaller and medium-sized business that do not advertise in Deseret’s legacy media-that include online deals, travel and reservations products and the creation of a digital agency that provides merchants with search engine optimization and search engine marketing. Some of these digital agency services originate in house, but others are done in conjunction with outside partners-which is one significant way in which it differs from the Santa Rosa Press Democrat’s Media Lab venture. The other crucial element was a decision to launch what Gilbert calls “digital only sales channels” using digital only sellers for clients who had been advertising in legacy products, but were too often overlooking the online platform. “This is in great contrast to many newspaper organizations who believe their primary mechanism for selling digital revenue is to leverage existing print channels to sell digital revenue,” says Gilbert, who acknowledges the path toward figuring out how to build up digital ad revenue was littered with some unsuccessful experiments. Gilbert is blunt about the economic damage done to the legacy newspaper business. In two years, the Deseret News lost almost one-third of its display advertising revenue and almost three-quarters of its classified business. He cites research showing that in terms of real dollars, the overall print newspaper industry in the U.S. has been knocked back to revenue levels of the 1950s, losing 60 years of growth. The new brand of the Deseret News is summarized by the slogan: “When your family needs to know more.” The company believes that message can reach a national audience and that theme was an integral part of the new Sunday national edition, which was launched on Jan. 1 2012. In that first edition, Deseret News editor Paul Edwards penned a page-one note to readers talking about “an unmet gap in the national marketplace of ideas. Speaking personally as a parent, striving with my wife to share a legacy of faith with our four children, I have been disappointed by the indifference of national media to some or our families’ most cherished values,” he wrote. The Deseret Daily News editorial philosophy is evident from its front page. The day that Pew Research visited, that page included extensive coverage of the vice presidential debate, a story about a recent outbreak of pertussis in Utah that can be attributed to too many children not being vaccinated and a story about a local family who recently adopted five siblings from a foster home. In Gilbert’s theory of media evolution, there is another entity positioned somewhere between the legacy and digital businesses. It is what he calls an “exchange team.” In 2010, the company created Deseret Connect, a web-based content management system (CMS) that curates stories written by citizen-writers and serves several significant functions. It helps fill the print reporting gaps left by the layoffs at the Deseret News, particularly in sports and lifestyle; it connects the newsroom to the community by becoming the vehicle for generating content from roughly 3,000 community-based contributors; and it also became a source of content not only for the print paper, but for the online news product. According to Deseret Connect editing manager Jacob Hancock, since its inception, Deseret Connect has generated more than 14,000 stories. In recent months, the role of Deseret Connect has been expanded as the entire newsroom, not just outside contributors, has begun to funnel content through the Connect CMS. In some cases, the staffers are edited by the remote team, but usually their stories are handled by the News staff editors. And although it’s not an independent revenue stream, the platform may play an increasing role in the development of one. One of the advantages of Deseret Connect, says Edwards, is that “it is well designed [to facilitate] syndication,” the sharing of Deseret content with other partners and media organizations. The company identifies that syndication effort as the most important innovation going on right now. “We are becoming a mature company at Deseret Digital Media,” says Gilbert. He estimates digital revenue has grown by an average of 44% in each of the last three years, and anticipates that it will account for 50% of company revenues by 2016. In 2013, he continues, DDM will add as much in new revenue as it earned in its first year of existence. Gilbert describes the progress of the digital agency revenue stream as “hyper-growth,” projecting that it could eventually account for 20% of all Deseret Digital Media revenue. The company has not yet implemented a paid digital subscription plan, but it appears to be in the offing. At the Deseret News, Gilbert estimates that overall print revenues dropped about 5% in 2012, but he is encouraged by positive results in circulation. In the six-month period ending September 30, 2012, daily News circulation rose to just under 92,000, up substantially from about 70,000 a year earlier, with the big gains coming from digital editions. The Sunday circulation, dramatically bolstered by the new national edition, jumped to 176,000, up from about 94,000 a year earlier. About 70,000 of that gain came from the national edition. 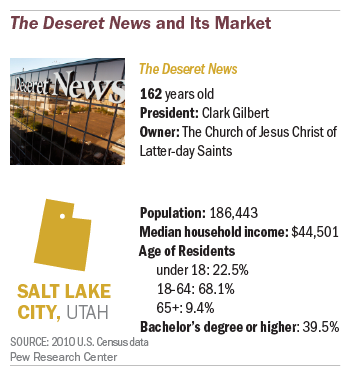 While Gilbert expects “the local edition to continue to grow at a modest rate in Utah, [we] expect [national edition] circulation to grow in the double digit range over the next two to three years.” Currently subscription dollars account for about 30% of overall print revenue at the Deseret News. 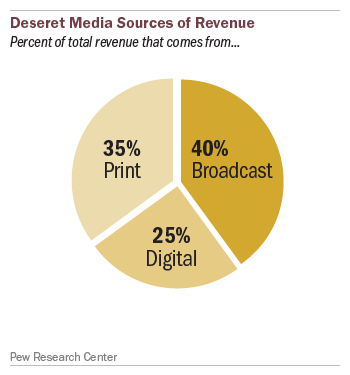 Gilbert doesn’t offer up precise numbers when asked how the revenue pie at Deseret will ultimately be divided between print, broadcast and digital. But he reiterates his confidence that the digital business will soon account for half of those dollars. In keeping with his view of an industry transformation in which the legacy product will continue to shrink, the CEO projects “modest declines” for print revenue in the next few years, with growth in circulation revenue offsetting, to some degree, diminishing advertising dollars. “While many national publishers are forecasting five percent [print] declines over the next few years, we believe we will beat that number,” he says. Nevertheless, the huge 43% cut in newsroom staffing-along with the replacement of the editor and publisher-were traumatic events that raised eyebrows in the media industry, where they became the subject of much debate. Media analyst Alan Mutter described it as a “draconian effort to save some semblance of the News.” A story in the Salt Lake Tribune reported that “some observers worry [the cutbacks] could diminish the standards of news coverage Utahns have relied on for more than a century.” In the blogosphere, the paper was criticized for not having the resources to send a photographer to a Brigham Young University football game. Today, the paper still has reporters who follow breaking news in traditional beats, but they cover those beats through their new editorial focus. But as difficult as the newsroom cuts were, the most challenging task for an ex-Harvard professor suddenly running a major media company was selling culture change, and in fact multiple culture changes, to the staff. Todd Handy, the vice president of Digital Business Development, recalls those uneasy meetings that first brought the television and print web teams together at the newly created DDM. That revelation was among several recent “trigger points” that forced Deseret to rethink its advertising strategy and move more legacy clients into the digital side of the sales operation. Gordon Borrell, the CEO of Borrell Associates and a leading media analyst, is a fan of what Gilbert is doing in Salt Lake City. But he doesn’t minimize the difficulties in implementing that model. But Earl J. Wilkinson, executive director of the International News Media Association, believes there are important lessons that other news organizations can take from Deseret, including its decision to narrow its editorial mission. “To my eye, the simple act of identifying the areas on which the Deseret News stand says something about the brand,” he adds. That editorial rebranding is one lesson, among others, that can be gleaned from the Salt Lake City experiment. Reduced costs commensurate with significantly reduced legacy revenues. This may be a controversial concept in an industry where many argue that reduced resources translate into reduced quality. But Gilbert says newspaper revenues are back to 1950’s levels and “in the transformation age you have to get a steep reduction in content cost.” He believes this idea can work as long as you wisely allocate remaining newsgathering resources.